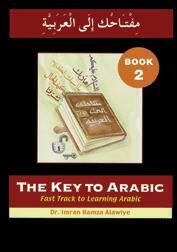 The Key to Arabic Book Two builds on the reading and writing skills taught in the first book of the series by introducing students to simple sentence structures and key aspects of Arabic grammar, together with a basic vocabulary of well over three hundred words and expressions. Students are taught how to greet people and say goodbye, how to introduce themselves and describe where they live, as well as speaking about their nationality. They are also taught some aspects of everyday etiquette. Through this book, students gain an understanding of non-verbal and verbal sentences and are introduced to past and present tense verbs in their simplest singular forms. They also learn about attached and detached singular pronouns, uses of the three different cases (nominative, accusative and genitive), masculine and feminine nouns and adjectives, interrogatives (questioning words), adverbs, prepositions and many other points of grammar. application of the topics covered.